More remarkable, perhaps, than the life story of any other player now before the public is the career of Edna May Pettie, the daughter of a Syracuse letter carrier. Her stage name is doubtless known to every newspaper reader in England and America. Not gifted with unusual talent, by real cleverness in ma­king the most of herself this pretty girl from central New York has found the center of the lime-light that shines upon the English speaking stage. The keynote of Edna May's popular­ity is brought out in a statement made by Manager George W. Lederer, as long ago as 1900, when, after her pronounced hit with "The Belle of New York," in London, he said to a newspaper man: "What I like about her is that, notwithstanding her extraordinary success, she is still the same simple, modest little woman that she was on her first stellar appear­ance in New York. She has none of the 'big head' so prevalent among ac­tors. Her success in society abroad - she has sung at any number of drawingroom entertainments - is due to the fact that she has the happy faculty of being able to look wise and say little. She can say 'yes' and 'no' in a prettier and more fetching way, and she can say it oftener too, than anyone else I have ever met." Although Mr. Lederer claims to have "discovered" Edna May, it was Oscar Hammerstein who gave her her first po­sition. That was in the autumn of 1896, when he was rehearsing "Santa Maria," a light opera for which he himself wrote both the words and the music. The piece was put on in the theater part of Olym­pia, as it was then called - the Criterion Theater, as it is now. This girl from Syracuse simply walked into Mr. Ham­merstein's office One morning and in­quired if he had an opening for her in the chorus. She told him that she was a soprano, but after he had tried her voice she agreed to be set down as a contralto. At any rate, he engaged her, and as she showed a laudable desire to take things seriously and to work hard, Mr. Hammerstein made her understudy to Lucille Saunders. More, he even wrote in a trio for her, Marie Halton, and Eleanor Elton. During this first winter in town, Miss May did more than get a start on the stage; she fell in love, and before spring was married to Fred Titus, the crack bicycle-rider. When it came time to take "Santa Maria" on the road, she did not wish to leave her husband - as it happens, they have since been divorced - so she and Mr. Hammerstein parted company, and, after some skirmishing around, Edna May Pettie, as she was then called on the program, found a tiny part in " A Con­tented Woman," which the late Caroline Miskel was playing at the Madison Square Theater. Now, it chanced that Mr. Titus's sister, Sylvia Thorne, was in the chorus at the Casino, and she sug­gested that her sister-in-law try to get in there, where shows were likely to run through the summer. She spoke to her manager, Mr. Lederer, about the matter, and his reply was: "Send her along, and I'll take a look at her." The "look" was so satisfactory that Miss Pettie was assigned to a position in the chorus of "The Whirl of the Town," and everybody about the theater promptly forgot that there was such a person until Kerker and Morton's new piece, "The Belle of New York," came up for rehearsal. "'We want some demure little girl for the part of the Salvation Army lass," said librettist Hugh Morton, who, when he uses his own name, is C. M. S. McLel­lan, author of " Leah Kleschna." Demure prima donnas are not exactly a drug on the market, but after several names had been suggested and dismissed, Mr. Lederer had an inspiration. "There's a little girl in our chorus," he said, "who would look the part to the life." "But can she act it?" Mr. Morton desired to know. query of composer Gustave Kerker. "I think she can be taught to do both," replied Lederer. "Besides, it will be a novelty to spring a brand-new leading woman on our audiences." The experiment seemed to be worth trying, and Miss Pettie's training for the part was begun. Much has been printed about this training, some writers claim­ing that Edna May was "a manufactured prima donna," as though that was some­thing altogether unheard of in stage-land." I can't begin to describe to you the al­most brutal rehearsals we had to go through before I got her to do the part just as I wanted her to," said Mr. Led­erer, referring to the matter some three years later. "There were notations on the music showing just what she was to do with her eyes at certain notes, and arrows were chalked on the stage to show how she was to move." Miss May herself intimates that Mr. Lederer's labors with her were purely those of the mechanic. She ascribes most of the credit for het success to Mr. Kerker and Mr. Morton. As a matter of fact, there is nothing particularly dis­graceful in admitting that one is a "man­ufactured" star. What else is Mrs. Les­lie Carter? According to the testimony in a court of law, Mr. Belasco even went so far as to drag her about the stage by her hair. "The Belle of New York" has a deal of music which cannot help being "catchy," as it is reminiscent of only the brightest bits from other scores, contains several episodes which are as silly as they are shocking, and - wondrous to relate - a real moral. This is embodied in the influence a Salvation Army lassie has on a young man about town, and in promoting Edna May from the chorus to impersonate the part the Casino directors have made a happy selection. The piece had no extended run in New York; its decided hit was reserved for London, whither it was transferred at a hazard in the early part of the fol­lowing year. It ran at the Shaftesbury Theater for six hundred and ninety-seven consecutive performances, or until De­cember 30, 1899, and during that period Edna May became the idol of West End playgoers. She returned to America for a short tour, and in the spring of 1900 appeared in London again in another musical comedy by the authors of "The Belle of New York," and in a role cre­ated at the Casino by Lillian Russell. The piece was called "An American Beauty." One of the English critics' comments began with: "What a pity! A house full of friends, a gorgeous welcome, a successful first act-and a 'fizzle out' !" I have often thought that the secret underlying the enormous popular­ ity of "The Belle" with London audi­ences lay in the fact that Miss May's part brought forward a type which is even more familiar in England than it is in America. The following autumn found Edna May back in the States and under new management, that of Charles Frohman. By midwinter she was projected as a star in New York, still with "The Belle's" makers as sponsors for the vehicle. But they seemed to have exhausted them­selves as mascots with that first venture, for "The Girl from Up There" fared sadly at the hands of the reviewers, and was never a big winner with the public, either in New York or in London, whither it was afterward removed. The commentators were inclined to give Vir­ginia Earl a higher rating in the produc­tion than the star, and altogether Miss May was justified if she felt a bit dis­couraged. Though "The Girl from Up There" failed to do much for its supposedly leading figure, it served playgoers a good turn by transferring from vaudeville the team of comedians, Montgomery and Stone, who scored heavily as a brace of "limber pirates" - Solomon Scarlet and Christopher Grunt respectively - showing their ability to fill the positions in "The Wizard of Oz" to which a little later they were assigned. As for Miss May, Mr. Frohman kept her in London for some years after that, and gave up American-made vehicles. In England exclusively, then, she ap­peared in "Kitty Grey," "Three Little Maids," and " La Poupee," not returning to New York until she headed the cast of "The Schoolgirl" at Daly's in Sep­tember, 1904, when her real subjugation of Manhattan may be said to have begun. This was firmly cemented the following year when she returned to the same house in "The Catch of the Season." 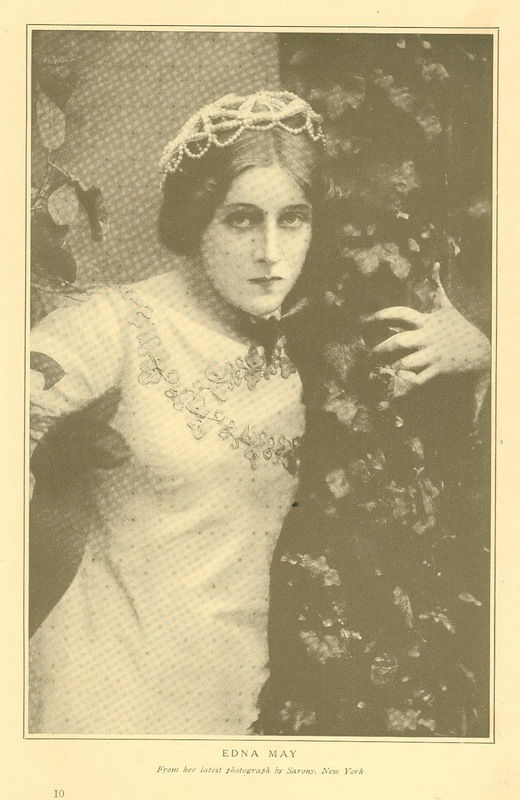 Since that time Mr. Frohman has kept her in England, where she originated the title role in "The Belle of Mayfair." She left the cast of this piece very sud­denly last autumn, under circumstances which will be remembered in the stage history of London, inasmuch as the epi­sode caused the withdrawal of Charles Frohman from the management of the Vaudeville Theater in that city. Miss May objected to the featuring of Camille Clifford jointly with herself in "The Belle of Mayfair" bills. The theater management's retort was that they must feature Miss Clifford - formerly a chorus-girl at Daly's in "The Prince of Pilsen" - because she was engaged to marry a British nobleman. Thereupon Miss May walked out of the cast, and was upheld by Mr. Frohman for so doing. He straightway had another vehicle prepared for her, and on January 10, last, "Nelly Neil" was produced at his new London house, the Aldwych, where it is still running. In this three act musical play England and America have united in supplying the libretto and the score, Ivan Caryll being responsible for the music and C. M. S. McLellan for the book, which the author has evidently en­deavored to model as closely as possible after his own "Belle of New York," written when he preferred to hide his musical comedy connections under a pseu­donym. Miss May plays the part of a socialist, "an uncertain and self-acknowledged in­sincere one" - to quote a London critic "yet with the greatest of ease and with few arguments beyond those set out in her banner song, in which the day , when the poor and the rich won't know which is which seems to be the ardently de­sired culmination of her hopes, she con­verts all grades to become her followers." It is not unlikely that "Nelly Neil" will prove Edna May's swan-song on the stage; for last winter she announced her engagement to Oscar Lewisohn, a brother of Jesse Lewisohn, and son of the late Adolph Lewisohn, the American "copper king." She will continue to live in England, where young Mr. Lewi­sohn owns a place near Ascot. Her sis­ter Jane is now in the support of John Hare, at the Duke of York's, in "The Great Conspiracy," and a younger sister, Marguerite, is said to be almost ready to take Edna's place on the boards. If, with as many drawbacks at the start, she suc­ceeds in becoming as internationally fa­mous as Edna May, she will indeed prove a wonder. Originally published in Munsey's Magazine. June 1907.